Mandarins are considered the signature crop of the foothills. Foothill growers are challenged by poor soils, limited water, increasing pest pressure, and production costs. Many of us are employing non-traditional techniques to counter these challenges. Two of these practices, pruning and mulching, are currently being studied by UCCE Placer/Nevada in collaboration with five local growers. In the past, citrus growers were warned not to prune. We were told that pruning would harm the trees, reduce yields, and be detrimental to our bottom lines. We attended UCCE workshops and learned differently. Many of us took the plunge and have been pruning our citrus for years. We have seen improvements in the orchard. Pruning citrus is believed to improve tree health, decrease pest populations, reduce pesticide use, and improve fruit yields and quality. Mulching has not been a practice in most orchards. Fertilizer and herbicides were not very expensive, water was plentiful. Mulch increases soil water-holding capacity, reduces surface evaporation, and adds organic matter to soil while increasing microbial activity. This study will evaluate the impact that mulching has on the soil, trees, and herbicide use. Wood chips, horse manure, and other sources of organic materials are readily available and inexpensive. In our orchard, we started mulching when the drought began. Our water use didn't increase and more importantly our trees didn't suffer from stress. We think that the mulch provided us with some drought resilience. The study will evaluate this. UCCE is at the beginning of this project. Research trials have been established in five commercial mandarin orchards. All five have mulching trials and three of the orchards have pruning trials. Horse manure and wood chips have been identified as a readily available, inexpensive source of mulching material. Mulching parameters, such as composition, depth, area, and application timing were discussed and determined by the participants. Samples of the mulch being used in each orchard are being analyzed. Pruning guidelines have also been set. Growers were trained to ensure that pruning is performed consistently across the study orchards. Baseline data on soil parameters, such as water holding capacity, texture, nutrients, organic matter and microbial activity, has been completed for the first year and will be performed each year. Soil analysis results were reviewed with the growers and fertilization plans discussed. Soils moisture is being monitored with soil tensiometers. Data loggers capable of tracking temperature and relative humidity are installed at each trial location. Data on physical tree parameters, such as canopy volume and density, tree trunk diameter, and other characteristics is also being gathered. 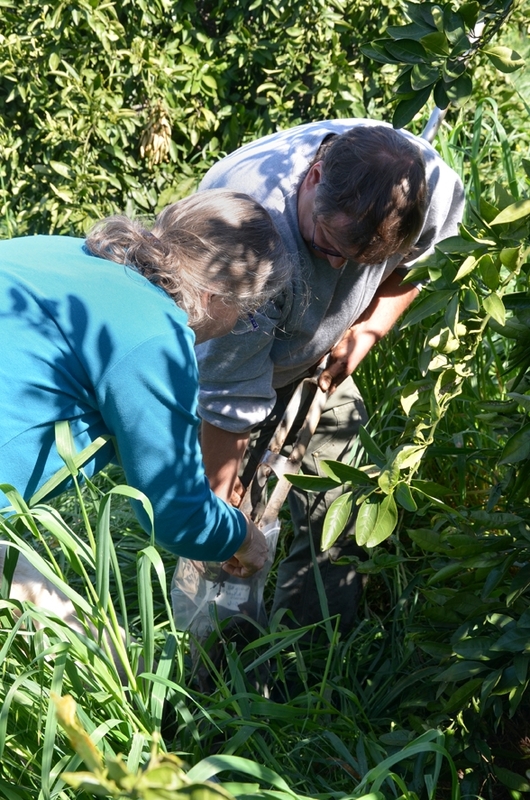 In August each year, leaves from each orchard will be tested for nutrient composition. In October, we will harvest individual trees in the experiment and collect yield, fruit quality and color data. As the trial progresses, results will be reported at grower meetings and UCCE-hosted workshops. UCCE will also hold workshops to teach producers the pruning and mulching techniques used in the trials. Completion of the research will result in a detailed analysis of the impact of pruning and mulching on commercial mandarin orchards. The desired result is the widespread adoption of pruning and/or mulching practices among citrus and other specialty crop producers.